Don’t worry if you can’t find the time to read the 24-page document, here’s a sneak peek into the 10 items that got me enthusiastic for what Qlik has to offer us in 2019 and beyond. I must mention at this point that what you are about to read is not a guarantee and no purchasing decisions should be made off the back of this blog. Any interpretations made are my own and may not be 100% accurate. 1. Tightly integrate Qlik Data Catalyst with Qlik Sense. Qlik plans multiple points of integration in 2019, namely the ability to catalogue QVD files and perform end-to-end data lineage tracking from data sources through to Qlik Sense applications. Based on some information I heard last year, this would allow Qlik users to access data sets in an Amazon-style shopping experience, enabling users to browse and consume data based on various metrics, including freshness, quality and popularity. This will certainly provide more visibility around the data being imported and used within Qlik applications. I personally look forward to seeing this being integrated as it can only improve Qlik Sense’s self-service capabilities and intuitiveness. 2. Integrate Qlik Web Connectors directly into Qlik Sense. For those of you currently utilising Qlik Web Connectors, this comes as a sigh of relief, as it signifies the end of one additional download to maintain. For those who haven’t ventured into the hundreds of other connectors offered by Qlik Web Connectors, this will signify the start of even greater potential from your Qlik solution, which will help you further increase your return-on-investment by obtaining data from more sources. In-particular, data from third-parties such as Google Analytics, Facebook, Twitter and Survey Monkey. The full list can be found here. 3. Make data preparation more accessible to everyone. Stated as 2019 and beyond, Qlik have detailed that they are planning workflow improvements for data preparation, a variety of new, advanced data-transformation capabilities, and improvements to augmented capabilities for data profiling and automation. I’d very much like to see the ability to perform table joins and an out-the-box method for incremental loads within the data manager – fingers crossed. It’s no secret that Qlik’s Data Catalyst, formerly Podium Data, had some of these capabilities but whether this technology be integrated, or whether it replace the data manager altogether – time will tell. 4. Investing heavily in AI capabilities. The future for Qlik is AI, with a focus on machine learning and the planned introduction of associative insights; providing contextual suggestions on relevant insights hidden in the unrelated data (grey). Additionally, we can expect to see a global search from the Qlik Hub, performing natural language queries across all applications. As well as augmented data storytelling functionality and content and data augmentation suggestions (which I believe has been nicknamed Data stories 2.0). This last statement I believe to be crucial, as many companies are still relying on third-party presentation software such as Microsoft PowerPoint, instead of using Qlik Data stories and keeping the data in a governed environment. Hopefully, the reinvention of Data Stories will prompt users to keep data in a single environment, allowing them quick access to the latest data, and more time spent on data analysis and less time spent on slide-creation. 5. Out-of-the-box advanced analytics capabilities. Advanced analytics is still a hot topic but is rarely implemented in small-medium sized businesses due to the high cost associated with the necessary resources (technology and man-power). Last year we saw some improvements to the Advanced analytics connectors but little to reduce the barrier to entry. Hopefully, that will change in 2019 with Qlik announcing the development of a new framework and services to provide out-of-the-box advanced analytics capabilities, with onboard Python processing. In addition, Qlik are hoping to further expand the cognitive engine by offering algorithmic and predictive insights that can be interactively explored by users, as well as key driver analysis, forecasting, anomaly detection and clustering – bringing a whole new meaning to guided analytics. 6. Evolution of collaboration capabilities. Qlik are continually committed to enhancing the user experience. Their latest focus is on insight management – allowing people to capture, organise, share and act on the most relevant insights. This is something I talked about in a blog post recently, covering the current methods of sharing insights in Qlik Sense. Some of the enhancements discussed in Qlik’s statement of direction includes driving action with the ability to set goals and tasks, be kept informed through data, social and system driven alerts and monitor insights using self-service digests. All the aforementioned falls under prescriptive analytics and is a growing subject with more and more people/organisations becoming data-driven and will be a key requirement of a post-modern analytical platform. 7. New native app for Android. Unfortunately, there is no time-scales provided for the native Android application but a native android app will be welcomed by many, although in the meantime you can still use your preferred browser on your mobile device. The mobile app is however listed as having offline support, like with the existing IOS app. A Blackberry EMM product is also noted. 8. Managed reporting capabilities directly in Qlik Sense. Noted under the section header ‘Qlik NPrinting’ I found this little nugget – integrated managed reporting capabilities directly in Qlik Sense. Does this finally mean that NPrinting will at last begin to be truly integrated into Qlik Sense? Hopefully. My interpretation is that Qlik Sense & NPrinting administrators will have a single management console to administer and maintain both products – meaning out-of-the-box, NPrinting tasks will be capable of being triggered on the event of a Qlik Sense app completing successfully. Several enhancements have been listed here, such as the ability to build objects for use in mashups without requiring a baseline Qlik Sense app, richer tools for developers to build, manage, and version components, app ‘promotion’ across different environments, and integration with source control systems. Qlik’s vision is to make the Qlik Dev Hub central to the development of platform-based applications. This coincides with Qlik’s vision for the future of making embedded analytics simple and efficient everywhere, and ensuring analytics is accessible throughout the business process and not just the at the end. Qlik are clearly attempting to arm developers with a surplus of tools and capabilities to ensure this becomes a reality. Last but by no means least, Qlik have announced they will be replacing their current SaaS (Software as a Service) solution, Qlik Sense Cloud Business, with Qlik Cloud Services in 2019. Current customers will be transitioned across at some point this year. The new offering has many improvements planned, such as the cloud hub, single identity management and support for extensions. In addition, new capabilities will likely be introduced to extend data connectivity and content workflows. 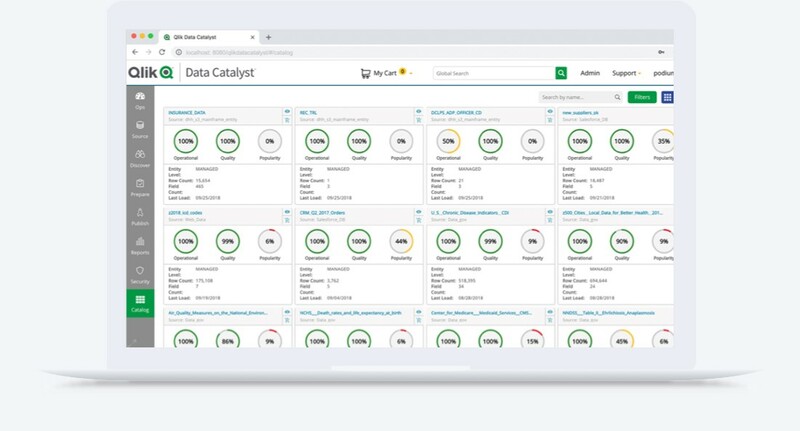 Qlik customers will also have the option to deploy Qlik Sense Enterprise as a full SaaS solution or hybrid deployment, based on Qlik’s new multi-cloud architecture. This will benefit global organisations who may have deployed a local Qlik site per geographical region. In summary, Qlik have outlined a vast and valiant direction for 2019 and beyond. I for one look forward to seeing their vision become a reality over the next 12 months and more. As always, I will be reviewing the latest releases as they are introduced. To keep updated with the latest Qlik announcements, features and knowledge articles in 2019 remember to follow us on Twitter, LinkedIn, YouTube and our blog.